Trobairitz posted an interesting challenge. 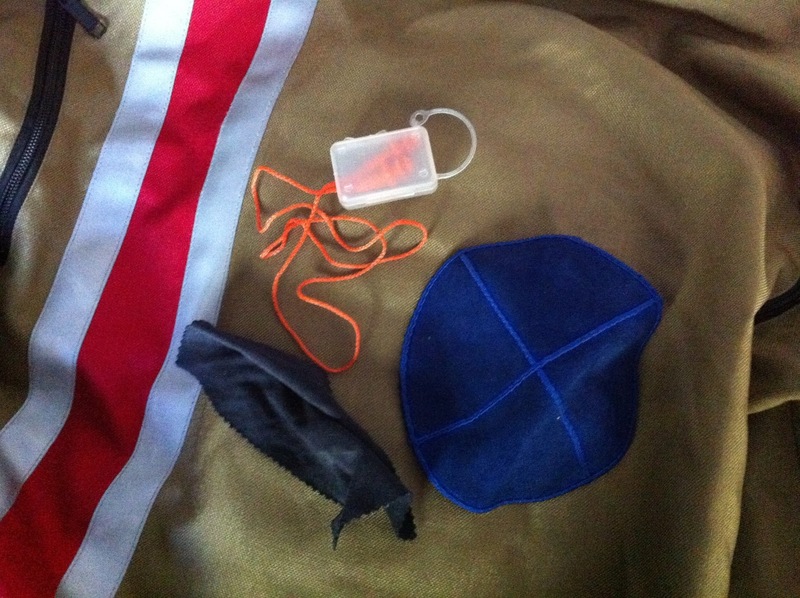 A show & tell challenge of jacket and pants pocket contents. For some reason, this challenge really appeals to me. Left jacket pocket: Ear plugs in their container. Blue suede Yarmulka from a Bar Mitzvah a few years ago, that turns out to save me from helmet hair. No I'm not religious, and not even Jewish, though my wife and kids are. I'm hoping that, should there be a God, he or she won't take offense. Micro-fibre lens cleaning cloth. 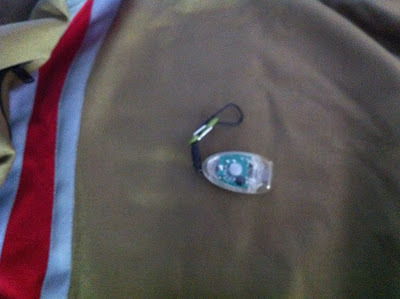 Right jacket pocket: Ignition key on an Inukshuk buckskin key ring. The ignition key, thanks to Jimh of allmotorcyclekeys.com, is keyed to my topcase as well. Vespa keychain my daughter bought me in Rome, with a second ignition key; a key to a miniature set of handcuffs that is a keychain I used to use for my Miata, since sold; the key to my helmet cable lock; an electric-garage-door opener; and a key to a Kryptonite lock that I never use but still carry in the Vespa pet carrier. Office keys, with a Swiss+Tech Utili-Key Stainless Steel 6-in-1 Multi Tool. Interestingly, that Utili-Key has never been spotted by airport security. Micro-fibre lens cleaning cloth. 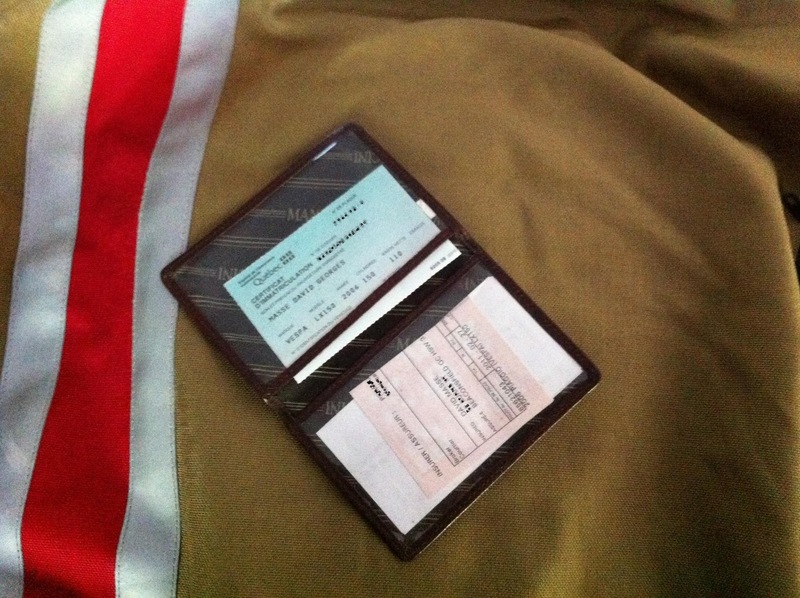 Inside jacket breast pocket: Slim wallet with Vespa registration and insurance slips. 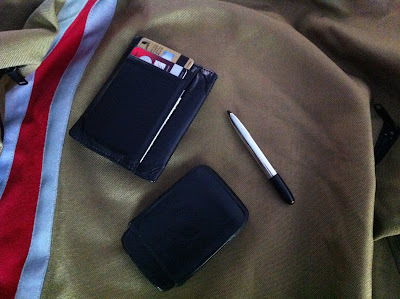 Left pocket of my riding pants: Wallet with driver's license and the usual assortment of ID and credit cards. Leather business card case. Fisher Bullet Space Pen. Right pocket of my riding pants: Mountain Equipment Coop Turtle Turbo LED flashlight with a miniature carabiner double clip. Loose bills and change if I'm carrying any. I carry micro-fibre lens cleaning cloths in each jacket pocket because I wear glasses and they get used - a lot. Thanks Trobairitz, that was fun, and it satisfied the very small urge that I was harboring to post my pocket contents on the very interesting (apparently only to guys) everyday-carry.com blog. If you're curious what others are carrying, check out Trobairitz's blog. I notice from your Fisher Space Pen that you might be a PEN collector. Not everyone would buy something like that. Our parallel worlds just seem to get amazingly closer. I keep virtually nothing in my riding pants or riding jacket, except for two things, well . . . 3 if you count kleenex tissues. camera in my left pocket for quick access. While touring I often put it in my tank bag so I can grab it whilst rolling, and my phone in my right pocket. 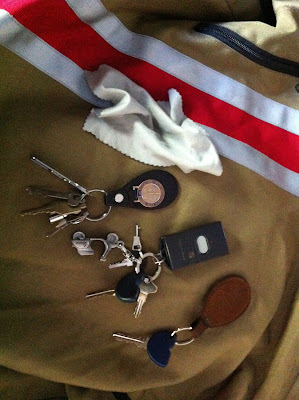 wallet, $$$, flashlight are in my shorts, underneath and my keys are on a lanyard around my neck. 8 or 9 sleeps . . . Thanks David, for the intimate view into your pockets. You look very organized. I thought Bobskoot would be impressed with your carrying a flashlight. For some reason that makes me think of him. And I'm not the only one that carries their earplugs in a case when not in use. I thought it was just me for a minute. Glad I'm not the only one that insists on a lens cleaning cloth! Random edges of t-shirts and the like just won't do it !!! Bob, I do have a thing for pens but I wouldn't say I collect them, because I have too few and those I have I have had for a very long time. I use a fountain pen for signing stuff (which I do a lot of, because of my job). It's a Sheaffer. I've actually got two identical Sheaffers, both fountain pens, one with a black body, one stainless steel. I have a rare broad square calligraphy nib that makes my signature look better because the lines alternate broad or narrow depending on the angle the nib happens to be traveling. The space pen never leaves the left pocket of whatever pants I wear. The Sheaffer lives in the outside breast pocket of whatever suit jacket I happen to be wearing. What I do collect are inkwells. I must have something like 25 different inkwells: some very old, some very modern, some damaged, some in pristine condition, some boring, some pretty weird (like the military world war I era one that's made from a horse's hoof and a shell casing). Sonja, I'm a true Gemini. Parts of my life are very organized, other parts chaotic. It's good always to have some small screwdriver, knife and flashlight close to hand. I'm an old boy scout. Trobrairitz, the case is a necessity because I use permanent silicone earplugs that I've grown fond of, and they get gross. The case contains the grossness. 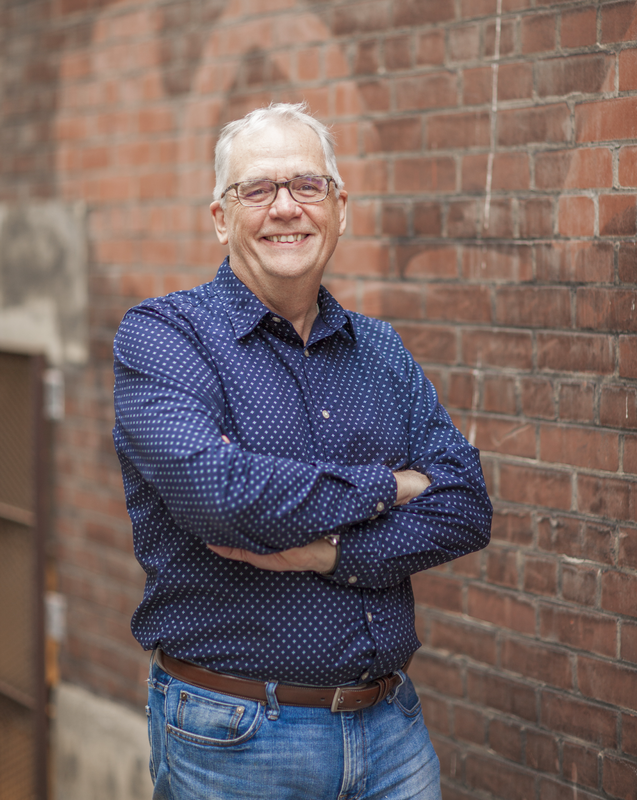 KP, there's nothing quite as nice as fresh sparkling clean lenses, and nothing quite as annoying as a smudge. Thanks for visiting and for the comment. Always nice to welcome a new commenter. Seeing these various posts I feel quite incomplete. Other than my wallet and the keys for whatever vehicle I happen to be riding/driving my pockets contain mostly lint. I should carry those microcloths though as I too wear glasses and have to replace scratched lenses about every 6 months from cleaning them on my shirt, oily rag, or whatebver else may be handy.